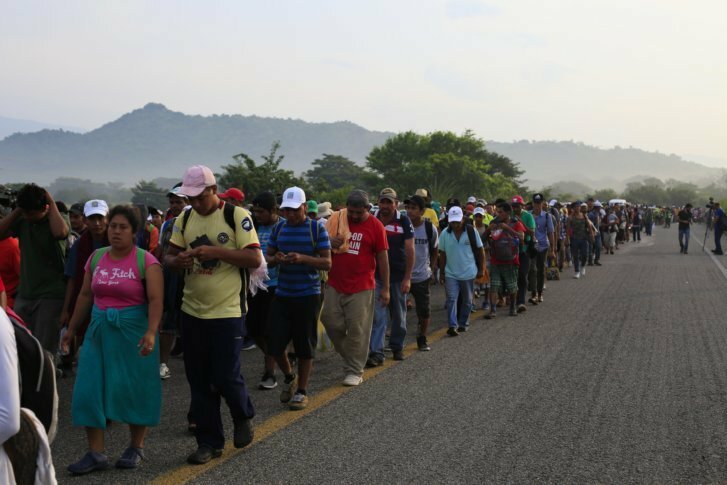 TAPANATEPEC, Mexico (AP) — The Mexican government seems torn between stopping several thousand Central American migrants from traveling toward the U.S. border in a caravan or burnishing its international human rights image. After another brutally hot day on the road with her husband and 8-year-old son, Alejandra Rodriguez said the possibility of health care and a work permit in Mexico sounded enticing. But as she laid out a tarp and blanket to sleep in a covered parking area in Tapanatepec, the 26-year-old from Tegucigalpa, Honduras said she’d prefer to start a new life further north. She had heard that job opportunities were scarce in southern Mexico. “Our destiny is to get to the border,” said Orellana, who left three children behind in San Pedro Sula. She was also suspicious of the Mexican proposal, fearing that she would be deported if she applies for asylum in Mexico. Several mayors have rolled out the welcome mat for migrants who reached their towns — arranging for food and camp sites. At other times, police have ejected migrants from passenger buses or prevented smaller groups from joining the caravan. This year’s caravans have earned the ire of Trump. The Pentagon approved a request for additional troops at the southern border, likely to total several hundred, to help the U.S. Border Patrol as the president seeks to transform concerns about immigration and the caravan into electoral gains in the Nov. 6 midterms. Stoking fears about the caravan and illegal immigration to rally his Republican base, Trump insinuated that gang members and “Middle Easterners” are mixed in with the group, though he later acknowledged there was no proof of that. Associated Press writers Julie Watson and Amy Guthrie contributed to this report.